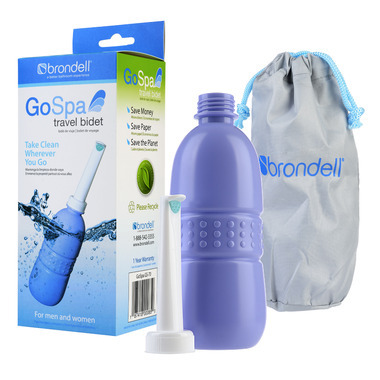 The Brondell GoSpa travel bidet is the easiest way to take the refreshing cleanse of a bidet wash on the go. The GoSpa travel bidet fits conveniently in your briefcase, purse, suitcase or glove box for an instant bidet wash anywhere. The discreet carrying bag and easy store nozzle make the GoSpa a perfect solution every time. Simply fill with cool or warm water, screw on the cap, point the ergonomic nozzle in the correct direction and squeeze the soft bottle to get a cleansing posterior or feminine bidet wash when you need it. Take it with you on vacation, to work or whenever you leave home. The GoSpa travel bidet, take clean wherever you go.